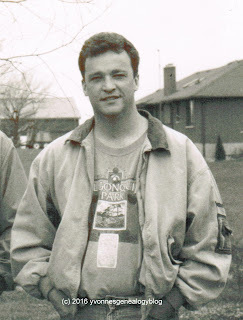 My maternal cousin Gérard Legault passed away on 22 February 2006. I still remember the shock I felt when I was told that Gerry, as he was known to his family, had died suddenly in a car accident. As his sister-in-law spoke of his passing, my thoughts went back to my childhood. I could see in my mind’s eye the many times my family would drive from our home in Timmins to stay the weekend with his family in their big, roomy house in Kirkland Lake. My sister and I had such fun with our cousins – seven boys and one sister – during those carefree days. There were lots of games, lots of teasing, but most of all, lots of laughter. My sister and I were rather quiet girls at home, so it was a treat for us to be surrounded by Richard, Michel, Raymond, Robert, Jean-Paul, Lise, Patrick, and Gérard, who were high-spirited individuals. Gérard was only 42 years old; he was the youngest of his family. It’s hard to believe that ten years have passed since that fateful day. Family, childhood times, and all our memories keep those we've lost close to us.